Seven hundred British Redcoats marched out from Boston to Lexington and Concord in search of illegal arms. The Barrett farm	was their goal. British spies had good information: illegal arms, gunpowder and other military matériel were indeed hidden at James Barrett's farm three miles northwest of the center of Concord, Massachusetts (map). In fact Barrett, colonel of the Middlesex Minutemen, had directed the stashing of 10 tons of musket balls and cartridges, four small brass cannons, 50 reams of cartridge paper, 31 barrels of flour, 17-1/2 tons of rice, and 8-1/2 tons of dried fish to 30 houses throughout the towns of Middlesex County, with significant quantities—including the brass cannons—stored at his own farm. When the redcoats crossed the North Bridge over the Concord River on April 19, 1775, they were turned back by musket fire from 6000 Minutemen under the command of Colonel Barrett himself in the first American victory of the Revolutionary War (now celebrated each April on Patriots Day). Colonel Barrett had received a land grant for his farm from the king of England. In 1910, the Barrett family sold the farm to the McGrath family, and so the farm changed families only once in more than three centuries. 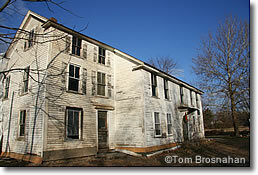 The original farmhouse, inhabited right through the 20th century, had fallen into woeful disrepair. Acquired by Save Our Heritage, Inc. under an agreement with the National Park Service, the farm has now been carefully restored by Save Our Heritage, 57 Main St, Concord MA 01742, info@saveourheritage.com. Neglect of the historic farmhouse had its good side: the house saw very few modifications or modernizations over the centuries. A surprising amount of the structure remained just as it had originally been built. Here's how it was restored. 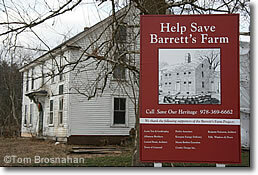 The Barrett Farm, 448 Barrett's Mill Road, Concord MA (map), is open to the public on special occasions (especially on Patriots Day, April 19th), and you can always view it from the outside. From Concord's Monument Square, follow Lowell Road north (to the left of the Colonial Inn) to the blinking light and turn left onto Barrett's Mill Road (map). The Barrett Farm is a mile along on the right-hand (north) side, just past Strawberry Hill Road. Above & Below, Colonel James Barrett's farmhouse, Concord MA.